In a case from Upstate New York, Justice Robert Muller sitting in Essex County, New York, Supreme Court had a new and interesting argument presented to him. The case involved a wife who had left the marital residence with the parties’ three children. Two other children of the parties continued to reside with the father. Justice Muller was presented with custody issues within the confines of a divorce case. 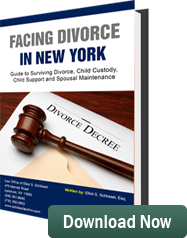 The mother wanted child support for the children living with her and spousal maintenance (alimony). There were arguments made between the husband and the wife with regard to how much each party was earning. Eventually the court ruled the husband should pay the wife temporary maintenance in the sum of $370 per month. The husband advised the court there was a farm located on the land where the marital residence was located. He sought to have the maintenance paid to the wife in the form of meat, eggs, and vegetables from the farm. The father requested the court allow him to pay the child support and maintenance with regard to the various items grown or maintained on the farm. Judge Robert Muller found this to be an interesting argument. However, the attorney for the father was unable to produce any precedent which authorized one party to pay maintenance and child support payments with food instead of money. The father’s request to pay the child support payments with food was denied. For those of us who live in the Metropolitan New York area, this seems like a humorous case. However, in Upstate New York, in rural communities, where cash flow on farms can be difficult to obtain, the argument of getting credit for providing food, eggs, produce, meat and vegetables to a spouse to allow her to feed her children, is an interesting argument. Although I don’t believe the entire child support payment should be allowed to be made in food, it is not inconceivable a court in Upstate New York might someday allow child support payments to be made, with regard to parties living on a farm, with a portion of the food, produce and meat raised on the farm. Elliot Schlissel is a father’s rights attorney. He represents fathers in divorces, custody and child support proceedings.